In this episode, an important character introduction, light foreshadowing and a surprising amount of talk about the 02 kids get overlooked because Joe apparently got laid. From the moment tri. started, one of the biggest looming issues has been the missing Zero Two kids. They've been out of the picture from the start, and they haven't been on the minds of the main cast until the Digimon Kaiser showed up at the end of last movie and everything went haywire. With the issue literally standing in front of everybody, it hangs over everyone's heads, particularly those in the audience. We don't get as many answers in Confession as we want, but there are two important developments. One is that the crisis has grown to a point where it's just as big a deal as four missing people, and affects the digidestined in a more personal way. The other is that the Zero Two kids actually get discussed quite a bit. It's just that the less satisfying moments overshadow the important material, and that the stuff that matters is all hiding in this opening episode. It's all very subtle, so it feels like nothing of consequence is happening and the episode suffers as a result. But at least there are layers to pull back. The Zero Two kids come up in three scenes here. 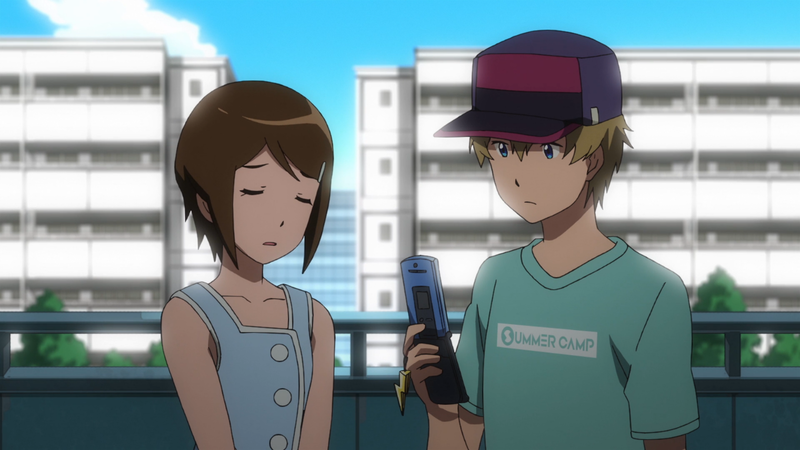 Prompted by the Kaiser's appearance, Takeru and Hikari are finally doing some welfare checks on their 02 cohorts! That's good! But Ken's not at home (nor are his parents, curiously). That's bad. Takeru and Hikari are clearly worried about this! That's good! But Daisuke, Miyako and Iori aren't returning their phone calls either. That's bad. Takeru promises to keep investigating! That's good! We don't see him investigate for the rest of the movie. That's bad. Takeru pats Hikari on the shoulder, prompting her to blush and comment on his maturity. That's... I'm not touching that one. We'll circle back to that alleged maturity later. 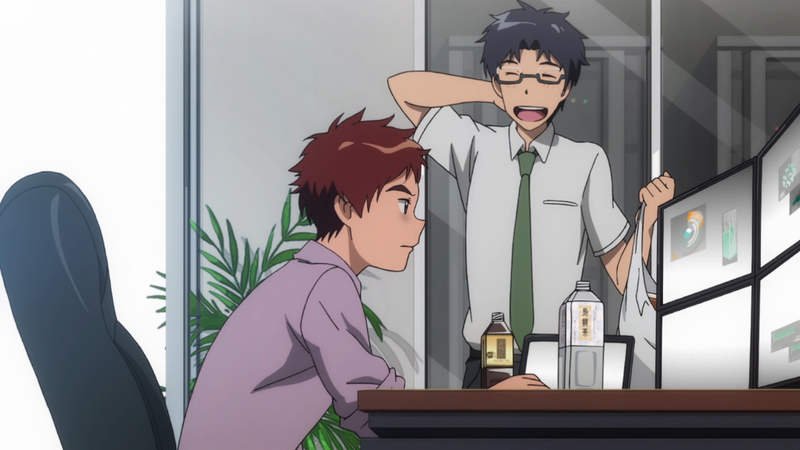 The other two scenes go hand-in-hand in that they both provide clues to how much Maki and Daigo know about the missing digidestined. 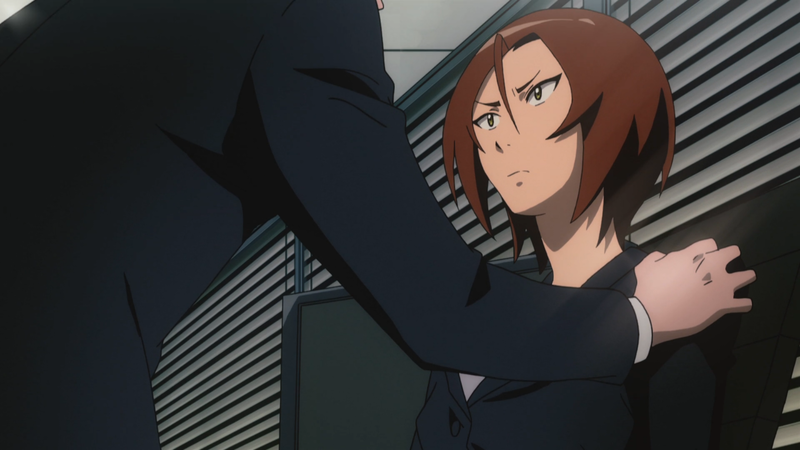 After an unsettling briefing addressing the spike in electrical disruptions around the country, Maki worries about seeing “victims again” (even clutching the laptop listing the 02 kids as missing) as Daigo worries about the active digidestined having “that harsh experience.” Then, much to Daigo's dismay, Maki reassures a suddenly inquisitive Yamato that they are checking on the safety of all the digidestined, unwilling to admit they are missing. Yes, it's a sketchy move on her part. Also, Yamato accepted this far too easily. He might not have been the best candidate for this job, especially since he never interacted much with Ken (except for that one time they took that trip to Mexico and met this cute girl and things got a little weird). But take these scenes together and it is at least a little more acknowledgement and a little more information. Yamato isn't the only one failing to get clues. Koushiro's running himself ragged trying to find out as much as he can about the infections. His approach to asking Meiko questions yields nothing and pisses everyone off, he fails to take care of himself, and he doesn't seem to bother with going outside. It's a shame his obsession with gaining information traps him in front of his computer screen, as who knows what he could learn with some ground work to the distortion site or trying to talk to the agency. We know he has Maki's cell number! You know it's bad when Joe's the one trying to rehabilitate him. The rush of making Vikemon happen must have snapped him out of his funk, since he's eased off the books and participates in team meetings again. His giddy attitude when lecturing Koushiro and the way he stresses showering and grooming as the key to impressing the ladies suggests that he's also spent some quality time with his gal. Koushiro is not amused. The attitudes you see from Joe, Takeru and Yamato are in stark contrast to Meiko. The Kaiser ordeal and Leomon's murder should be enough to shut anybody down, but the digidestined are used to this sort of thing and recognize the need to function in spite of the trauma. Koushiro's looking for answers, Takeru's knocking on doors, Yamato's more conciliatory with Taichi, Joe's banging his girlfriend... Meiko, meanwhile, is falling apart. She's not the seasoned veteran the others are, and the psychological toll weighs heavier on her as a result. Sora offers her a reassuring (and hopefully prophetic) message about how partners and Digimon are permanently connected no matter what happens. That and a good cry gets Meiko back on her feet. It's fair to call her constitution into question, but she does make the original digidestined look unshakable by comparison. It's a good reference to bear in mind once the rest of the movie totally wrecks them. It's very odd how they insist on reminding us that for all the structural damage and emergencies caused by the infected Digimon, there have been no casualties. It's hard to imagine, first off, and it almost diminishes the impact of the crisis. At the same time, it also invites worse to happen later, and calls out Maki's “victims again” line. While it's sweet that Yamato is burying the hatchet with Taichi and understanding that more Ultimate Digimon takes the heat off of them, it's an awfully anti-climactic way for them to end their feuding. After the post-credits scene in Reunion and the big wall slam in Determination, it's strange for it to just peter out like this. Meiko's father is going to be an incredibly important character. He seems unfazed by the incidents, won't confirm that Meicoomon is tied to the disruptions the way Maki does, and doesn't seem to worry about his daughter even after Daigo says she's upset by all this. I'm not going so far to say he had a hand in the formation of some key element in this story but... he probably had a hand in the formation of some key element in this story. Meiko staring at the picture of her, Sora and Mimi with their Digimon at the hot springs is another major reason that bit was so important. With memories such a key theme going forward, it's not as effective unless Meiko had the chance to create some with the other digidestined. Labels: Izzy, Joe, Maki, Meiko, movie, tri. I think "Takeru's grown up" from Hikari is about physical growth, not maturity.